specialists who were acquired by Nationwide Platforms’ parent company, Lavendon Group plc, in 2011. 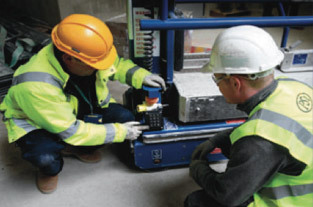 Designed to both prevent unauthorised use and improve the efficient use of powered access, SkySentry can be retrofitted to the vast majority of scissors, booms and lowlevel access platforms globally. on to the contractor, as well as reducing the carbon footprint of the project.